The Cornerstone Singers seek to draw audience members to know our Lord and Savior Jesus Christ and to bring the audience into a deeper relationship with Him through the use of music and musical drama. It is their daily prayer that God is revealed through each of the Singers and their testimonies. Song and story...two great traditions from the Bible...are brought to life by the Cornerstone Singers. Cornerstone Singers is a performing ministry which puts their love for the theater to use in God's kingdom. The Singers share the gospel through Broadway-style musical drama and songs, written by the Singers. Testimonies of what Jesus Christ has done in the Singers' lives make each performance unique and personal-whether at a concert, youth rally, conference, church revival, convention, or school assembly. 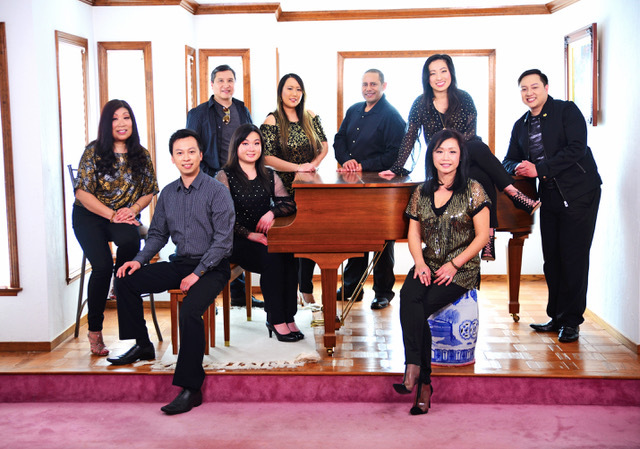 Cornerstone Singers was founded in 1989 by Cornerstone Evangelical Baptist Church’s Director of the Board of Regents, Dr. Chanson Lau. Since their founding, the Lord has opened doors to grow the ministry and to reach out to the world community. The Singers all lead busy lives, managing careers or college and families; but, each member also devotes him or herself to developing his or her performing skills for the sake of the ministry. Because of this devotion, the Lord has provided opportunities for the Singers to perform in both the United States and abroad. In 1990, the Cornerstone Singers began to share their ministry through touring. They have toured near their home church in northern California, as well as in the Midwest, Southwest, and East Coast of the United States. The Singers have also been blessed to tour on both coasts of Canada as well as several countries abroad, including China, Hong Kong, Taiwan, Vietnam, Singapore, Indonesia, and Australia. Each time the Singers tour, they are blessed with opportunities to meet new people and be able to pray for the people they meet. Some of these opportunities have led to lifelong friendships that start from a common basis—our Lord Jesus Christ. The Cornerstone Singers have also been blessed to be able to share the gospel message with an even broader audience through their albums, videos, and Facebook page. Currently, there are five albums and a sixth album in production. "Thank you once again for helping out with our Gospel Nite. The musical program was just superbly done by the Cornerstone Singers, and your witness as always powerful and challenging. I am looking forward to having you folks come over again because your program has touched many lives in our congregation. " "What a joy it was to have the Cornerstone Singers with us for a wonderful time of praise, worship, and challenge from God’s word. the singing and drama presentation by the Cornerstone Singers was a wonderful enhancement to these weeks of teaching on family themes here at Sunrise. I was personally blessed by the energetic and transparent way the gospel was shared. Our people are so encouraged by what God is doing at your church." " Very professional. Their choice of songs and dedication to serving Christ’s extended ministry on earth happen through drama and music each time the Singers perform. Their music spans all ages and demands each listener to re-evaluate his or her walk with Christ. Of all the groups I have been associated with, the Cornerstone Singers rate a cut above all the others. They care about their audience and give of themselves in a loving and professional style." "A high energy musical revue with a strong Christian message. My friends of all ages appreciated the show. It has great appeal to the Generation-X’ers. The Singers are beautiful people inside and out. Truly authentic believers who love and serve Christ with integrity." "They are great and very professional. They touched my life and their message came through very clear." "Many have told me that their opinion was that this was our best annual church picnic. Well…we've had some mighty good ones; but your spiritual emphasis and entertaining ways topped the cobbler with ice cream." "I would like to thank all of you for all the work you've done to produce such a great, heart-moving, and convicting musical. Personally, I was extremely touched by the characters that I could barely withhold my tears; outwardly I didn't cry out loud and my tears didn't burst, but inwardly I wept so hard I could hear myself sobbing. I think every soul was moved by your musical that night." "Last year, my daughter went home to be with the Lord. This loss was quite painful and difficult for me and my wife. Your songs ministered to my soul and spirit. Thank you." Copyright 2018 Cornerstone Singers. Simple theme. Powered by Blogger.